Click the photos for larger view. A central theme to The Great Gatsby is the idea behing the contrast of the idealism and the reality of the "American Dream." The American Dream generally refers to people's hopes to climb the social ladder by going from poverty to wealh and success. Although in fiction and throughout history there are those who are lucky enough to make it from the bottom to the top the reality for many dreamers is not so optimistic. First, this is represented in the novel by Wilson, the mechanic who lives in the desolate valley of the ashes. People who did have wealth were using up all the resourcse and leaving behind a disaster in their wake. All of the careless consumption had some effect on bringing about the Great Depression. The lifeless valley would take over more of the country during that next decade. Anyway, Wilson also dreamed of living a prosperous life and raising a family with his wife, but like most people he did not have great luck. This is one way Wilson acts as a bit of foil character in contrast to Gatsby's relative success. Gatsby's dream in the novel is to be wealthy enough to win over Daisy's heart. From the description of his home and his parties in the novel, there is little to no doubt that he has a large enough sum of money in his name to win her back and consider himself a rich man. Yet, the social system will not accept his new found wealth. Without Daisy's approval, Gatsby will always feel like he amounted to nothing. This is significant because America is supposed to be a democratic country in which all men are created equally. If this is the case one might expect a more meritorious and less caste like system of social life. Yet, this is not the case. The lack of real ability to tap into the wealth of the American Dream, not just monetary, but also the prestige caused many people to loose hope. The heavy demands of the higher classes led to many people taking illegal action to maximize their gains. This assumed about Gatsby as well expecially considering his friends like Wolfsheim. After all he went through Gatsby could not accept that his dream was unacheivable. As a writer of "The Lost Generation" Fitzgerald's work stresses disillusionment. The story of Gatsby is meant to teach that people cannot hold on to every little hope and wish forever. The reality is life is not fair and people are not going to get everything they want no matter how hard they may work for it. Though the novel also ends that even though this is the case people can still improve their situation. Even if someone may be struggling in the present or in the past, anything could happen tomorrow. So when things do not go the right way, look forward to bigger and better things. Do not dwell on the past. 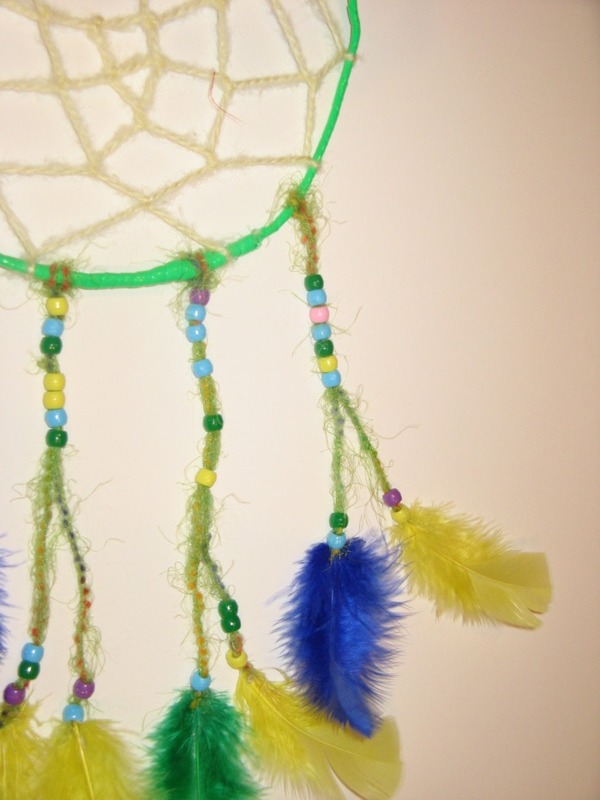 The dreamcatcher represents these problems with Gatsby's American Dream. A dreamcatcher is meant to capture nightmare's and only let good dreams reach the person sleeping. Nightmare's are said to be caught in the middle netting of the dreamcatcher and they vanish with the morning sunlight. Therefore, they are to be kept near a window. Good dreams are said to either pass through the hole in the center of the dreamcatcher or pass down though the feathers to the dreamer. The dreamcatcher is green on the outside because that is symbolic in the book of the American Dream and this is Gatsby's "American Dream" dreamcatcher. 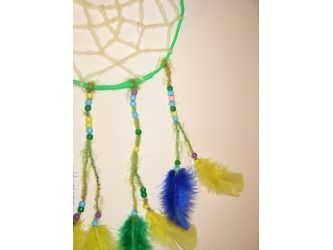 The netting on the dreamcatcher is yellow because yellow represents wealth and corruption. Wealth is part of Gatsby's dream, but it is keeping him from realizing what else is out there. He has become too narrow minded in his pursuits. 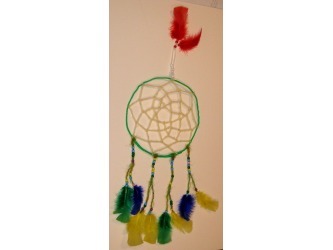 The dreamcatcher is distorted and does not do a good job of sorting Gatsby's dreams. Also, the dreamcatcher has allowed Gatsby to start dreaming so vividly that his dreams later cause him pain. "The colossal vitality of his illusion. It had gone beyond her, beyond everything." (95) He would not be able to stay happy with such outrageous expectation brewing. Other colors include his hopes for lavish wealth like the lavender beads. The blue beads and feathers represent the truely positive and blissful idealism of Gatsby's dreams that the reader comes to admire. They are his motivation. The pink beads foreshadow danger in the future caused by the failing dreamcatcher. 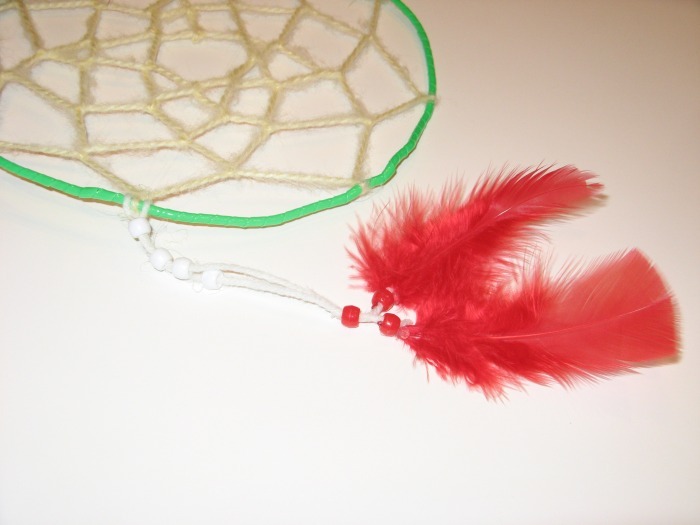 This corresponds to the top of the dreamcatcher which is the white beads and yarn for hanging the dreamcatcher adorned by red feathers. The white represents Gatsby's childlike innocence in his expectations that his dreams will all magically come true. This undying hope is what keeps hime dreaming at all thoughout his life and the parts that we learn about in The Great Gatsby. His pure devotion to Daisy and refusal to give up that she will one day she will leave Tom for him is also the underlying cause of his ultimate death. His tragic flaw is his eternal optimism. He refuses to accept that his fantasy cannot become reality. This childlike view magnifying by his dreams which "he had thrown himself into with a creative passion" (95) led to his premature death.